Learning new, fascinating, and sometimes boring facts in school is a rather daunting task. If you really think about it, kids have to be prepared to learn new things every day and then regurgitate that information in the form of test answers.Sometimes, kids nail their tests and other times they provide answers that are wrong but worth a few points just because of the humor they bring to our lives. Here are some absolutely correct but wrong test answers that will have you rolling on the floor laughing. This kid didn’t mince their words and for that, we love him. Because deep down, we definitely feel the same way. 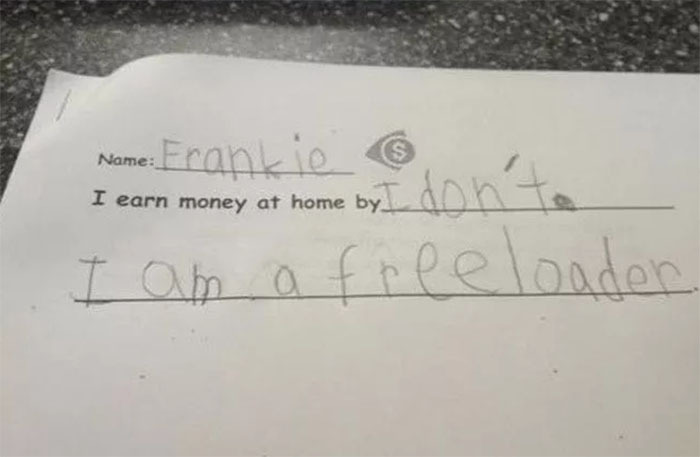 At least we know exactly where this kid stands on finding a job and supporting themselves. Maybe their attitude will change in the future and they’ll pick up a job or two, but honestly, we don’t know. In the meantime, enjoy your free ride kid, it won’t last forever! What we would give to have nap time again!